8th June, Riyadh: It was a big pay cheaque for PBA bowler, Michael Fagan of USA as he defeated challenger and fellow-PBA, Mika Koivuniemi of Finland, 199-177 in the final stepladder match to win the Masters title of the 1st Kingdom International Open Bowling Championship. Fagan of New York City, had earlier ended the 8-game quarterfinals with 1875 pinfalls and a comfortable 86 pins ahead of fellow compatriot and the strong finishing Tim Mack. Two massive games allowed Tim Mack to narrow the gap to 40 pins going into the final game but the champion kept his cool to bring home 219 against Mack's 191. 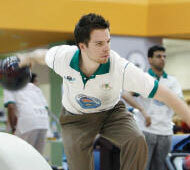 2004 PBA Player of the Year and winner of 7 PBA titles, Mika Koivuniemi of Finland finished third in the quaterfinals with 1794 with pace-setter, Abdulla Al-Qattan of Qatar, dropping to fourth on 1767. The final spot went to another PBA bowler, Tony Reyes at the expense of Qatar's Ahmed Al-Mohnadi missing his bonus frame in the final game from a foul shot. "I used the Storm Agent which hook alot more," said the newly-crowned champion. "I tried it out for two games yesterday and it looked good. I'm excited and relieved that it's now over. It's been a very distressful week despite bowling well. In the first two stepladder matches played simultaneously between second-seed, Tim Mack versus fifth-seed, Tony Reyes and third-seed, Mika Koivuniemi versus fourth-seed, Abdulla Al-Qattan, Mack easily defeated Reyes, 208-179 to set up the match against the winner, Koivuniemi, who beat Abdulla, 269-224. "I only shot one low game today but because I'm a fighter and never give up, I managed to crawl my way up the field," said the prolific Tim Mack. "Everyone one bowled well especially Michael and Mika. "I know I've made the stepladder but I feel bad for Ahmed Mohnadi after having seen him throw a foul shot in the crucial bonus frame," said the PBA bowler, Tony Reyes. "That's bowling. The Finn outclassed the American, 269-211 in the second match but could not find the same form going down to Fagan, 177-199 in the decider. Fagan was richer by US$38,000 in total, with US$25,000 for winning the title, US$5,000 for a special match against H.R.H. 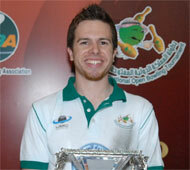 Prince Mohammed Al-Suad of Saudi Arabia, US$3,000 as top-qualifier and US$5,000 for the first perfect game. 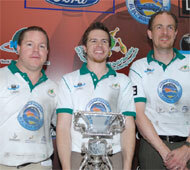 Koivuniemi took home US$12,000 while Mack won US$7,000 for his effort. The royal dignitaries and the large crowd which had gathered at the Universal Bowling Centre were also treated to an exhibition set up by Joe Ciccone and Ammar Yamin of Jordan. Fagan, Koivuniemi, Mack, Reyes and Ciccone demonstrated several trick shots to the delighted crowd. The top 16 Asians also made the cut for the inaugural ABF Tour Saudi leg which will be played tomorrow (9th June) at the same centre. LIVE scores will be featured at www.abftour.com. Photos by Terence Yaw in Riyadh. 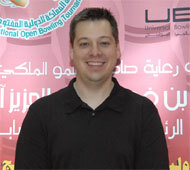 7th June, Riyadh: PBA bowler, Chris Loschetter of USA topped the first block finals of the 1st Kingdom International Open to lead the top 16 and Hong Kong's Wu Siu Hong into the semifinals at Universal Bowling Center. Loschetter, who had only manage to finish twice in his 4-year career in the PBA Tour, set a cracking pace with 278 in the first game to lead all the way ending the 8-game first block masters finals with 1899. At the halfway mark, the American had stretched his lead to 61 pins but his lead was challenged by Wu Siu Hong after the seventh game to just 17 pins. Despite a strong finish with 267 by Wu, a 227 in Loschetter's final game was good enough to top the field of 32 finalists. Wu settled for second with 1849 after two strong games of 265 and 267 in the last two games. "I made a good choice of using my Storm Zinc T-Road in the finals as it worked well," said the 27-year-old Loschetter. "I stayed soft with my hands and just rolled it to get good carry. I also made a lot of good moves over the 8 games. 2004 PBA Player of the Year and winner of 7 PBA titles, Mika Koivuniemi of Finland and second most of the way, dropped to third with 1848, just 1 pin adrift. Qatar's best finisher was Asian Championship Team silver medalist, Ahmed Al-Mohnadi in fourth spot with 1780. Two Saudis, Doha Asian Games Doubles gold medalist, Bader Al-Shaikh and Yousef Akbar did well to take up fifth and sixth positions with 1756 and 1663 respectively while Saeed Al-Hajri of Qatar, Tony Reyes of USA, Hussain Al-Suwaidi of UAE and Abdulla Al-Qattan of Qatar completed the top 10. Making the cut for tomorrow's semifinals were Yasser Abulreesh of Saudi Arabia, Fadhel Al-Mousawi of Kuwait, Tim Mack of USA, Adeeb A Alkulafi of Saudi Arabia, Michael Fagan of USA and H.R.H. Prince Mohammed Al Saud of Saudi Arabia from 11th to 16th. The top 16 would bowl another 8 games from scratch and the top 5 would proceed to the stepladder finals to determine the champion. 6th June, Riyadh: Americans dominated the qualifying rounds of the 1st Kingdom International Bowling Championship at Universal Bowling Centre with Michael Fagan leading compatriots, Tim Mack, Tony Reyes and Chris Loshetter to occupy the top 4 positions of the overseas pool. Micahel Fagan amassed a total of 2218 from three series of 3 games each. The American posted 752, 747 and 719, 54 pins ahead of Tim Mack, who knocked down 2164. Fagan also bagged the US$500 by topping the qualifying table. Tony Reyes finished third, just 6 pins behind Mack on 2158 while Chris Loschetter took fourth position with 2156, a further 2 pins adrift. National bowler, Hassan Al Shaikh led the top 4 local spots reserved for Saudi qualifiers with 2191 and second overall with 2191. 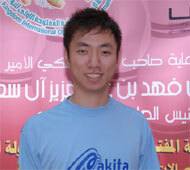 Hassan posted 773, 715 and 703 ahead of teammate, Bader Al Shaikh, who took second spot in the local pool with 2173. Ahmed Al Hayden and Rashed Al Fararaj assured themselves of a place in the finals with 2112 and 2083 respectively. Two time ABF Tour winner, Mubarak Al Muraikhi of Qatar was the best Asian qualifier on 2134 followed by Finalnd's Mika Koivuniemi in sixth with 2133. Bahrain's Hassain Ghulook Hassani, Qatar's Abdulla Al Qattan, Bahrain's Youdif Falah and Saudi's Yousef Akbar completed the top 10. The top 4 locals plus the top 26 overseas qualifiers together with 2 from the desperado squad will make the cut for the top 40 finals which will be contested on the 7th June. The top 16 at the end of the finals will proceed to the semifinals on the 8th June. The top 16 Asian finishers in the semifinals will also make the cut for the inaugural Asian Bowlng Tour Saudi leg which will be held at the Universal Bowling Centre on the 9th June, telecast LIVE on the local TV station.